Endless action games are such a perfect fit for mobile devices, as they typically offer short sessions and a strong urge to keep playing until you dominate your friends on the leaderboards. 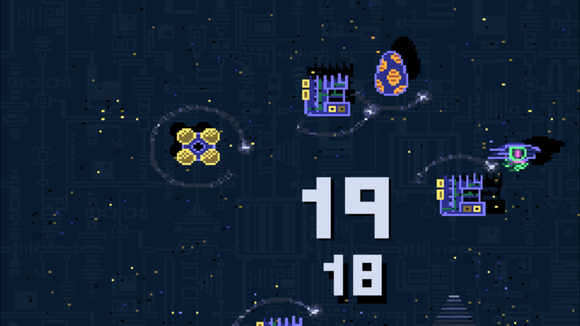 There's no shortage of such offerings on the App Store, and in my view, the more peculiar or abstractly these games are presented, the better—like Super Hexagon or Impossible Road, which are both starkly designed and immensely enjoyable experiences. Helix follows in the footsteps of those eccentric indies, with strange lo-fi graphics and a simple yet quickly punishing approach to score-chasing design. It's a game that finds you building a tally of enemy kills not by firing a weapon or tapping them out of existence, but rather by simply encircling them on the screen by moving your character in a 360-degree arc around them. 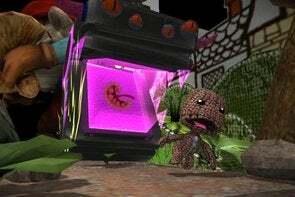 The resulting experience is tense and challenging—not to mention unpredictable—due to ever-changing enemy lineups and odd little twists that emerge from time to time. You can quickly see how much you've encircled each enemy thus far, and when finally cleared, it disappears with a satisfying pop and an updated score tally. It's the latest game from celebrated indie creator Michael Brough, who is best known for much less accessible fare—like the intelligent but obtuse Corrypt, which had you solving environmental puzzles in a perplexing dungeon, or the retro-stylized hacking game 868-Hack. Helix manages to maintain Brough's unique design sensibilities with thankfully much less head scratching involved. Ready to enter this weird world of circle-centric survival? Here are three of Helix's best qualities. It feels really fresh: Eliminating enemies by moving your character in a circle around them is an unfamiliar approach, but it's one that instantly clicks and feels really smart with a touch interface. 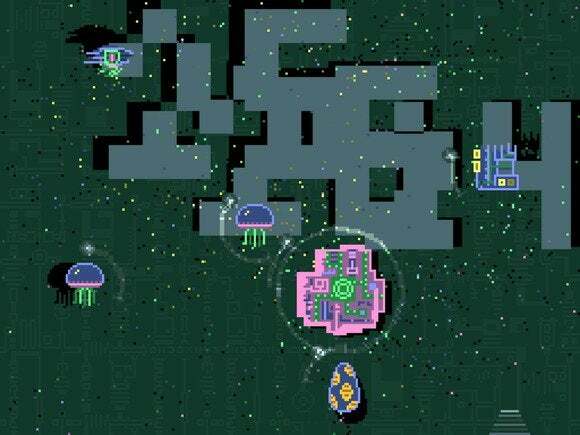 In fact, it reminds me a lot of Pacifism, an amazing game mode in Geometry Wars: Retro Evolved 2 for Xbox 360 that had you kill foes by guiding them into traps, rather than attacking them directly. Here, it's just as satisfying as crossing tasks off of a to-do list, only instead you're killing weird glitch monsters while trying to stay alive as the screen becomes ever-cluttered. The touch control scheme lets you place a finger down anywhere—preferably away from your character, so you're not covering its view—and start controlling its path. At first, the movements seem overly loose, but it feels solid before long, and you'll have to balance your desire to constantly clear enemies with the need to avoid death amidst the chaos. Once you start considering that strategic balance, your attempts will likely become longer and more fruitful. What even is this? Helix admittedly doesn't make the strongest of first impressions, but the gameplay makes up for the baffling menu design. The lo-fi look really works: Helix might be easier to learn and play than some of Brough's previous releases, but he hasn't compromised his tried-and-true visual approach to ensnare a larger crowd. The game still looks like a vibrant relic from the Apple II days, with chunky pixel characters that throb with minimal animation work, not to mention a rather garish-looking menu. 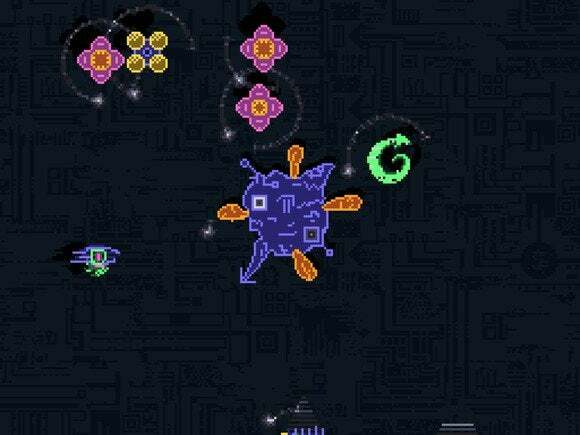 But it works well for this style of game, and it's definitely distinctive. Also, the pulsing chiptune music sounds like the theme from a 1980s sci-fi anime film, which really completes the aesthetic. Curious sights emerge, such as this large creature that rests in the middle of the screen. I've seen it multiple times, but haven't lived long enough to see what's next. 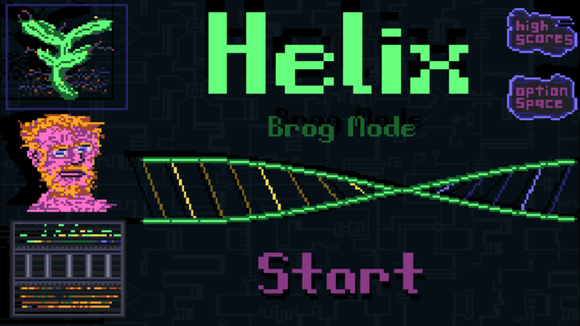 It'll keep you coming back: Whether in the standard (Brog) or much more frantic Terror mode, Helix has incredibly strong hooks. You might only last a couple minutes per attempt, but the ability to be right back at it with a tap makes it difficult to resist one more try—again and again. Also, you'll notice odd occurrences from time to time, such as a large creature that sits in the center of the screen, or a throbbing rainbow circle that starts to surround your character. Such curiosities only amplify the desire to push further and further. Also, in a surprising bonus, the iPhone and iPad experiences feel so different that it's worth playing on both to discover your preference. The iPhone screen feels more cramped, but the enemies are a bit slower; comparatively, the iPad display offers plenty of room, but the action is faster and the controls don't feel as manageable. For a while, I preferred playing on iPhone, but then I smashed through my overall high score on iPad and topped all of my Game Center friends. So try both if you can. Helix may not look like much at a glance, but by putting the onus on fluid, constant movement rather than attacks and direct interactions, this lo-fi wonder manages to feel really unique as it grabs your attention and never lets go. Each session may only last a minute or two, but good luck resisting the urge to play for hours and hours.